Braswell upgrade. 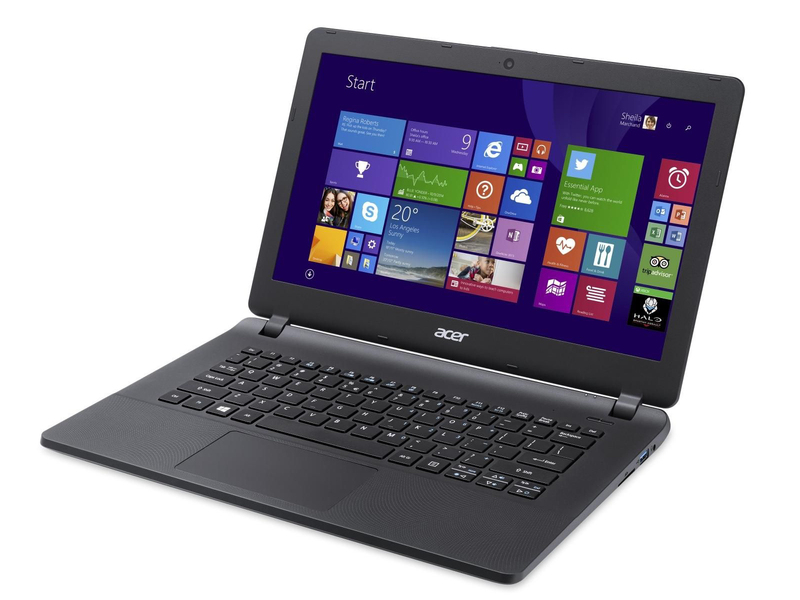 Acer's 13.3-incher delivers long battery runtimes, a decent keyboard, and a matte display. It is priced at about 380 Euros (~$424). However, the computer also showed weaknesses. Acer's 13.3-incher is not unknown to us. We already scrutinized the computer a few months ago. The Bay Trail processor was replaced by a new Braswell model in our test model. Our review will reveal whether the new CPU is advantageous. The Aspire is a representative of the low-price segment and does not have too many competitors. For example, there is the Aspire V3-371, which also stems from Acer, and the HP 14. Chromebooks like the Toshiba Chromebook 2 CB30-B-104 also belong to the competition. Since the Aspire ES1-331 and the ES1-311 share the same design, we will not cover case, connectivity, input devices, display, and speakers in detail here. Please refer to the Aspire ES1-311 review for information about these. The Aspire comes with the same matte 13.3-inch display as its predecessor. The display delivers a decent brightness and an acceptable contrast in view of the price point. Although it is the same display model, the measurement values are different, but this is usual. Two identical displays are never absolutely the same. The Aspire ES1-331 is a simple 13.3-inch office notebook. The processing performance of its Braswell CPU is sufficient for office and Internet tasks. Thanks to the long battery runtimes, it is useful as a decent mobile typewriter or Internet device. Our test model is available for about 380 Euros (~$424). Acer also offers variants with different hardware. A Celeron N3150 quad-core processor works inside the Aspire. It is a representative of Intel's current Braswell CPU family. The processor works at a base clock of 1.6 GHz. Thanks to Turbo, the CPU can accelerate to up to 2.08 GHz. A Bay Trail predecessor which works at the same clock rate is not available. However, we know from experience that a Braswell processor with the same clock rate is only very slightly faster than its Bay Trail counterpart. The CPU behaves the same way in the tested benchmarks in mains operation and on battery. Multithread tasks are run at full speed while the processor clocks at between 1.6 to 2.08 GHz in single-thread applications. We definitely had some issues with the computer. The system froze multiple times. This always happened when demands on the hardware were high. For example, we were unable to complete the stress test despite multiple tries. This also happened during the Tomb Raider benchmark. The computer crashes when GPU-Z is launched. The results of the PCMark benchmarks are normal for the used hardware platform. 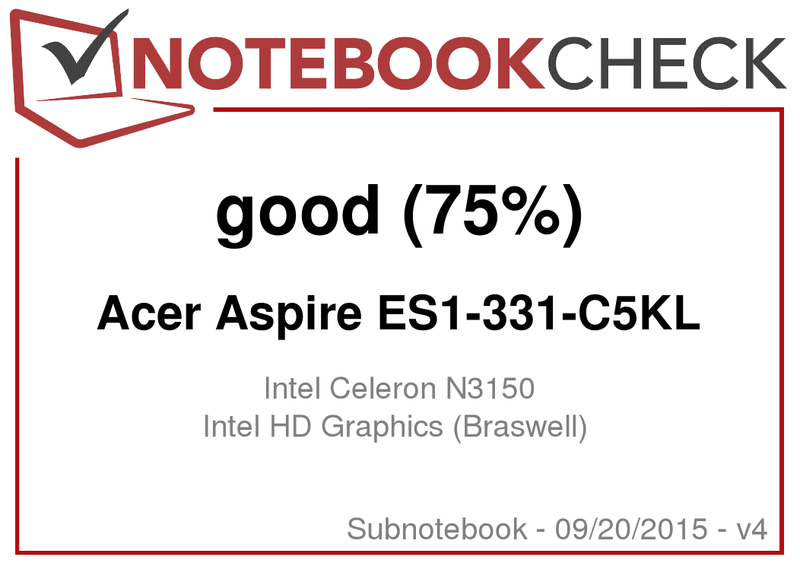 Thanks to a more powerful graphics core, the Aspire performs better than comparable Bay Trail computers. The system performance can be improved by replacing the hard drive with a Solid State Drive. The Aspire comes with a conventional 2.5-inch hard drive from Seagate. It delivers a capacity of 500 GB and works at 5400 rpm. The transfer rates are usual for a 5400 rpm hard drive. Intel's HD Graphics (Braswell) GPU is responsible for graphics. It clocks at up to 640 MHz. Although the clock rate is hardly different to the Bay Trail predecessor's, the Braswell GPU achieves almost double as high results in the 3DMark benchmarks. This is due to the Braswell graphics cores being based on the same architecture as the Broadwell processors from Intel. Thus, Intel offers graphics cores in the low price segment which can keep up with low cost models from AMD (Radeon R2 (Mullins/Beema) and R3 (Mullins/Beema)). In addition, Intel's new GPU brings an interesting feature, which is not available in the Bay Trail predecessor: It can play H.265 coded videos (H.265 is the successor of the familiar H.264). Although, the GPU is significantly more powerful than the Bay Trail predecessor's, it does not turn the Aspire into a gaming capable notebook. Only a few games reach high enough frame rates - at low resolution and low quality settings. Casual games from the Windows Store largely run without problems. The fan often stands still while the computer runs idle. Otherwise, it works at low speed and is drowned by the hard drive. The fan does not work much under load, either. During our stress test, we measure a noise level of 36.1 dB. We criticized that the fan produces a whistling noise in the predecessor model. The ES1-331 does so, too. As already mentioned earlier, we could not completely run our stress test. The computer froze again and again when we ran it. Nevertheless, we can say that the computer behaves the same way in mains operation and on battery. The processor clocks at 2.08 GHz. The clock rate of the graphics core already falls from 640 MHz to 360 MHz in the first few minutes. The notebook does not get especially hot. 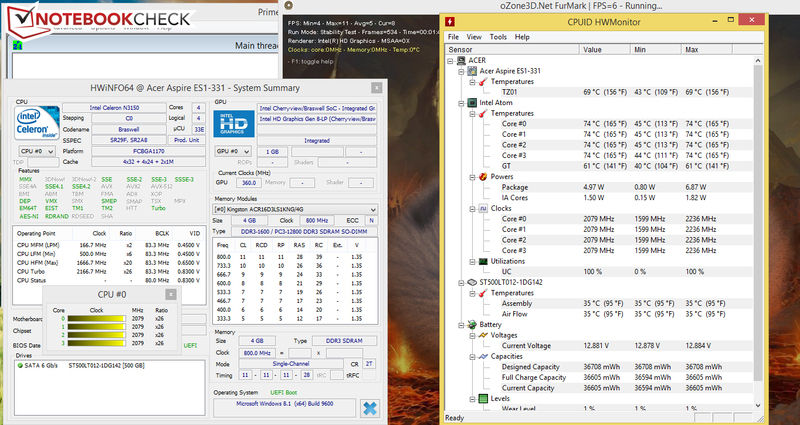 During our stress test, only a few spots just exceeded 30 °C. We measured a maximum temperature of 34.2 °C. (+) The maximum temperature on the upper side is 32 °C / 90 F, compared to the average of 35.8 °C / 96 F, ranging from 22 to 57 °C for the class Subnotebook. (+) In idle usage, the average temperature for the upper side is 27.5 °C / 82 F, compared to the device average of 30.7 °C / 87 F.
A 13.3-inch notebook with a very weak processor cannot have a high power consumption, which is proved in practice. While idle, the power consumption is up to 7.8 Watt. The energy demand also does not get unexpectedly high under load. We measured 16.9 Watt during the stress test. So, the Aspire is slightly more frugal than its predecessor regardless of the load. In our realistic Wi-Fi test we simulate load during web surfing. The "balanced" profile is active and the display brightness is set to about 150 cd/m². The Aspire achieves a good battery life of 6:35 h. But, it falls slightly behind its Bay Trail sibling. - The fan produces a quiet whistling noise. The Acer Aspire ES1-331-C5KL is a simple 13.3-inch notebook which is suitable for office and Internet applications. Thanks to the combination of matte display, decent keyboard, long battery life, and quite low price (400 Euros, ~$447), you'll get a mobile typewriter and surf device, which might be especially attractive for price-conscious customers. Unfortunately, the whistling fan of the predecessor remained. Since the fan does not work too often during everyday tasks, this is bearable. It is a more serious problem that the system crashes under load. This must not happen. The Braswell Aspire does not really bring advantages when directly compared to its Bay Trail predecessor. Those who do not need a higher graphics performance or the capability to play H.265 videos should consider our Bay Trail test model of the Aspire as an alternative. Currently, the latter is about 50 Euros (~$55) cheaper than our Braswell model. In addition, the Bay Trail model uses a more powerful processor. Compared to a Braswell model with a comparable processor, the price advantage of the Bay Trail model is even 70 Euros (~$78).